Since 1946, “Back Home Again in Indiana” has been performed during pre-race ceremonies at the Indianapolis 500. 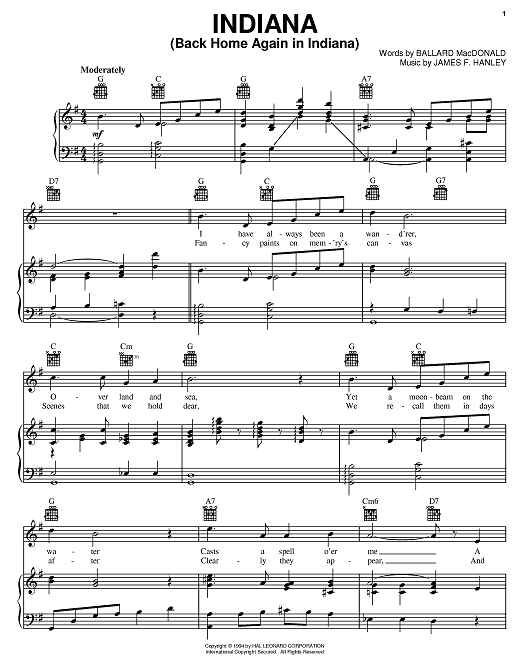 No other performer is more associated with the singing of this song at the Indy 500 than Jim Nabors, who admits that in 1972 when he first sang before the races 250,000 fans, he did not know the lyrics and wrote them on his hand. Nabors, accompanied by the Purdue Marching Band, notably performed the song in most years from 1972 to 2014. The song has long been the last event in the order of the day, immediately preceding the command given to the drivers to start their engines. After Nabors retirement, the honor of singing the song was done on a rotating basis, which had also been the case prior to Nabors becoming the regular singer. A cappella group Straight No Chaser performed in 2015 and The Voice winner Josh Kaufman performed in 2016. The Speedway has returned to a standard singer with Jim Cornelison singing last year, and again in 2018. “Back Home Again in Indiana” was composed by James F. Hanley with lyrics by Ballard MacDonald and published in January 1917. Although it is not the state song of Indiana (which is “On the Banks of the Wabash, Far Away”), it is perhaps the best-known song that pays tribute to the Hoosier state. The tune was introduced as a Tin Pan Alley pop song of the time. In 1917 it was one of the current pop tunes selected by Columbia Records to be recorded by the Original Dixieland Jazz Band, who released it as a 78 with “Darktown Strutters’ Ball”. This lively instrumental version by the ODJB was one of the earliest jazz records issued and sold well. The tune became a jazz standard. For years, Louis Armstrong and his All Stars would open every public performance with the number. To see Jim Nabors’ Last “Back Home Again in Indiana” performance in 2014 go to Final Performance. For more on other Indy 500 traditions go to Indy 500 Traditions.